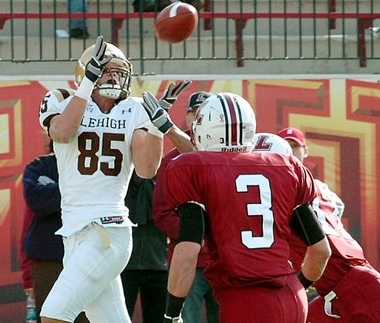 Seven Lehigh athletes made the first team offense and defense: senior WR Ryan Spadola, senior OL Mike Vuono made it on offense, and senior DT Sajjad Chagani, senior DE Tom Bianchi, senior LB Billy Boyko, senior CB Gabe Johnson and senior FS Billy O'Brien cracked the first team. More academic awards and athletic awards await, but congratulations on these awesome Lehigh athletes for what they've accomplished. Sam Jones, Holy Cross, So. John Macomber, Holy Cross, Jr.
Tom Mannix, Holy Cross, Sr.